Bicycling for Transportation examines the individual and societal factors of active transportation and biking behavior. 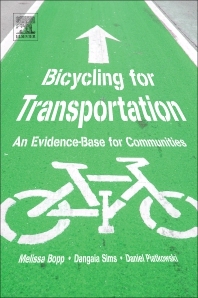 The book uses an Interdisciplinary approach to provide a comprehensive overview of bicycling for transportation research. It examines the variability in biking participation among different demographic groups and the multiple levels of influence on biking to better inform researchers and practitioners on the effective use of community resources, programming and policymaking. It is an ideal resource for public health professionals trying to encourage physical activity through biking. In addition, it makes the case for new infrastructure that supports these initiatives. Melissa Bopp, Ph.D. is an associate professor of Kinesiology at Pennsylvania State University. Throughout her career she has published extensively on active travel (walking and biking for transportation). Her interests lie in community and environmental approaches to encouraging physical activity at a population level. She also serves as an advisory committee member of ActiveEarth through the American College of Sports Medicine which is a science based initiative targeting sustainable transportation. Dr. Bopp is a member of her local community bicycling coalition and campus bicycle advisory board. Dangaia Sims, PhD is a Data Scientist and Senior Strategy Consultant within IBM’s Global Business Services group (New York, United States). She completed her doctorate at The Pennsylvania State University in 2016 where she conducted research on active transportation and active transportation policy (e.g., Complete Streets), particularly among underserved populations in the United States. Daniel Piatkowski, Ph.D. is an assistant professor of Community and Regional Planning at the University of Nebraska Lincoln and affiliate faculty of the Nebraska Transportation Center. He teaches courses in transportation planning, land use, urban design, and research methods. His research interests include travel behavior, sustainability, active transportation, and the intersection of urban design and transportation planning. Dr. Piatkowski is also a member of the Transportation Research Board’s Committee on Transportation Needs of Parks and Public Lands (ADA40) and a member of the Plan4Health task force of the Nebraska Chapter of the American Planning Association.